A decade has passed since humanity stood against the Kaiju and closed the breach. Using massive mechs called Jaegers, pilots beat back the monstrous Kaiju and closed their portal to Earth (the breach), effectively stopping the invasion – for now. 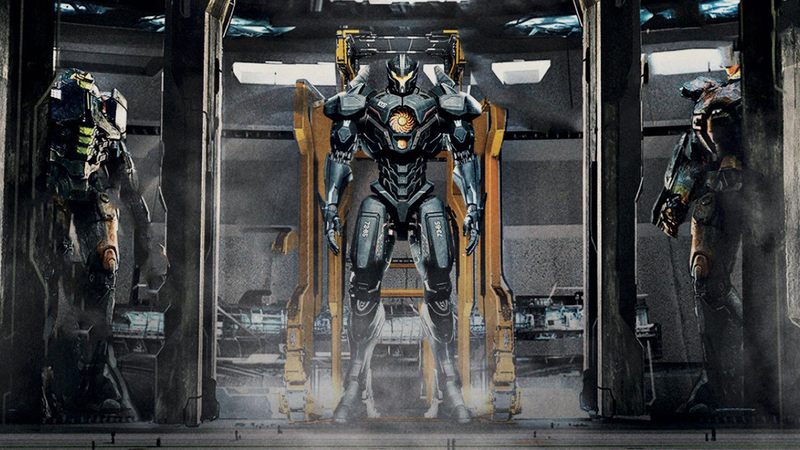 The Pacific Rim franchise makes its hay on epic battles between monolithic creatures and human-piloted machines. The sheer scope of the battles overwhelms the senses, widens the eye-sockets, and brings forth cheers of victory, of humanity’s ability to survive. It’s Man v Nature at its very core. How, then, can the Pacific Rim story continue if the monsters are dormant? How does author Greg Keyes fill three-hundred pages about monster-killing robots when, well, there are no monsters? We can firstly examine the three types of conflict that drives novels: Man v Man, Man v Self, and Man v Nature. Next, we apply the sci-fi algorithm, subtract the main enemy (Kaiju), and divide by the remainder. We solve for x and find only a Man v Man solution, which, with the wonderful backdrop of the science fiction genre, we are left with sabotage and espionage. Last, we find the square root of what drives our characters, carry the one, and add the personal demons of Man v Self that need dealing with before true heroism can be attained. If all of the above sounds familiar, you’re obviously a science-fiction aficionado, and I apologize for the unnecessary elaboration. If you’re new to the neighborhood, I welcome you with a hearty handshake. Pacific Rim is a great place to begin your stay here in science-fiction land. Ascension opens a window to the years between the first Kaiju battles and namesake of the franchise, and Pacific Rim: Uprising when the Kaiju make their inevitable return. We are allowed access to the Shatterdome – where Jaeger pilots train – and it is in this Shatterdome that the saboteur strikes and the plot takes off in earnest. The high stakes Jaeger pilot training program chews up and spits out the new cadets with little patience or understanding for anyone who can’t hack it. Think Top Gun, but with giant robots instead of F-16’s. The Jaeger program draws the most daring and driven of individuals, most of which have backgrounds of either high-pedigree expectations or trauma from past Kaiju attacks. Ascension focuses on two such cadets- Vik and Jinhai. Each has their own internal turmoil, and when the investigations of sabotage and espionage at PPDC begin to focus on these two cadets, the action heats to a boiling point. bsolutely love the backstory fill in of Jinhai and Viktoria, as well as grizzled veterans Lambert and Burke. I also immensely enjoyed learning about the faction of religious zealots who worship the Kaiju. The goal of any movie tie-in novel should include exploration of the franchise ‘universe’ and provide the reader with insight to characters and motivations we can’t get anywhere else. Keyes hits every mark set by fans and readers. This is a comfortable and easy-reading book. The plot hustles along and is not too complex. The characters behave in a predictable and satisfactory pattern. I found myself enjoying it despite my initial reservations with lack of conflict, but mostly because Keyes has a writing style that allowed me to look past the lack of content. He doesn’t take many risks here, but he also doesn’t make many mistakes, either. It’s a well-written piece. If you have interest in learning more about a post-Kaiju war world, including Shatterdome Jaeger Pilot technicalities, character backstories, and Jaeger weaponry descriptions, you can’t go wrong with Ascension. I also recommend a Pacific Rim movie re-watch before you do, if only to further the total immersion into the universe, and then check out Pacific Rim Uprising – Official Movie Novelization by Alex Irvine. You can purchase Pacific Rim Uprising – Ascension via Amazon or directly from Titan Books.